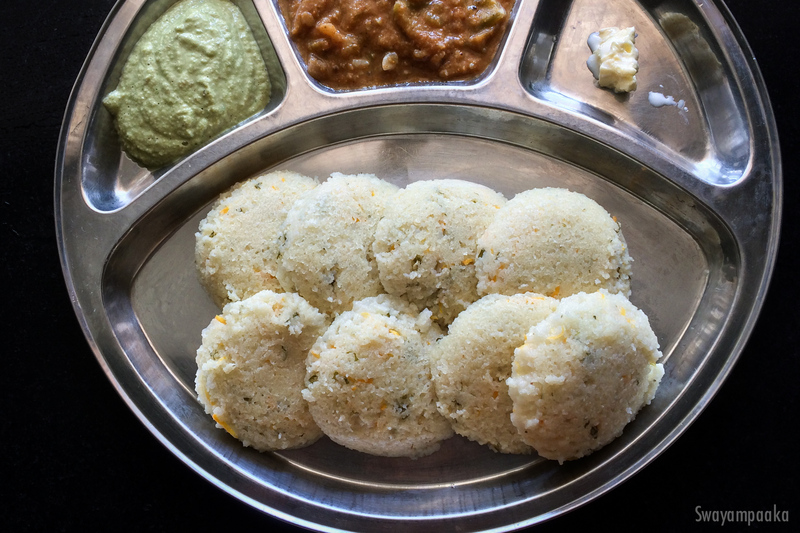 Idli is one of most popular and tastiest breakfast in southern part of India. Along with most popular Mallige Idli, and Rave Idli, there are many ways we can prepare the this breakfast. This is one of the instant Idli which requires no fermentation. It will be very soft and fluffy. If you want you can add pinch of soda to the batter. But I feel it is not needed. You can add vegetables to this idli, like green beans, squash, peas, corn etc… to make it Instant Vegetable Idli. Wash avalakki/poha add 1 cup of curd ,mix it well, keep it aside for 10 minutes. To the same add 1 more cup of curd, mix it well , keep it aside for 15 minutes. Grind it in a mixer jar to nice paste. Pour this avalakki paste to a bowl, to this add roasted rava, salt, carrot,chopped chillies,and coriander leaves, mix it well. Add enough water to get the idli batter consistency. Grease idli plate with oil and put the batter to each greased idli plate and stack it. Steam cook the Instant Idli for 20 minutes on medium high heat.Then turn off the heat. If you are using the pressure cooker to steam the idli don’t put the whistle and add enough water for steaming this idli. After 2 to 4 minute, remove the lid and enjoy the soft instant idli with sambar or coconut chutney or Onion tomato chutney….